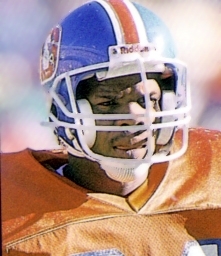 A small-college star who received All-North Central Conference recognition as a senior, Braxton was chosen by the Broncos in the 12th round of the 1987 NFL draft. A preseason shoulder injury relegated him to injured reserve for all of his rookie year, but he played in every game in 1988 as a reserve in the defensive backfield as well as on special teams and moved into the starting lineup at cornerback in ’89 where he led the club with six interceptions. A classic overachiever, his toughness and desire served to overcome a lack of size and speed. Braxton suffered a knee injury that required surgery three weeks into the 1990 season but bounced back to start for another three seasons from ’91 to ’93, intercepting nine passes over that span. He was released and went to Miami as a free agent in 1994, where he was a reserve, but returned to the Broncos in ’95 and beat out Rondell Jones to start at free safety. Broncos went 13-3 to finish first in the AFC West with the conference’s best record while leading the NFL in fewest rushing yards allowed (1331). Lost AFC Divisional playoff to Jacksonville Jaguars (30-27). Braxton played three more seasons for the Broncos and was part of two Super Bowl-winning units in 1997 and ’98. He finally retired after the 1999 season at age 35, having played a total of 13 seasons in the NFL, 12 of them with Denver. Braxton appeared in 181 games and intercepted 36 passes, four of which he returned for touchdowns. 34 of the pickoffs, and all of the TD returns, came with the Broncos. He added another three interceptions in the postseason, with one in the Super Bowl XXXII win over the Packers.